Flinders Island is south east of Australia. 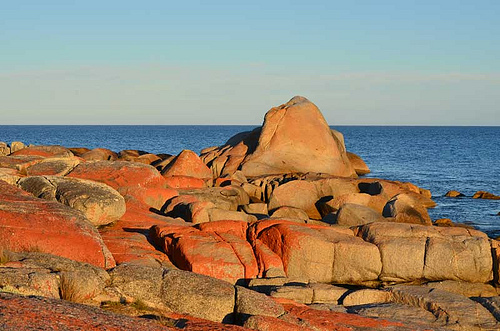 Flinders Island is the largest island in the Furneaux group of islands between Tasmania and the mainland Australia. There’s no boat traffic to the island, so you have to fly, but there are some great national parks and interesting island life to see. The biggest town on the island is Whitemark, where there is the island’s airport, and the usual array of shops, eateries, and accommodation such as Interstate Hotel, Leafmore in Whitemark, Carnsdale Host Farm and Flinders Island Cabin Park. North of Whitemark is another township, Blue Rocks, and further north is Emita. There is a museum in Emita, and more history to discover at Wybalenna, in the end of the peninsula west from Emita. North of Emita is Marshall Bay, and after that the road continues north to the Wingaroo Nature Reserve, the largest wilderness area on the island. There are heaps of wildlife to see like Bennett's wallabies, Brushtail possums, Cape Barren Geese, Short-tailed Shearwaters, Eastern Pygmy Possums, Potoroos, Common Ringtail Possums, Tasmanian Pademelons, and Cape Fur seals. In the Wingaroo, there is also some interesting native vegetation, and like shrubs along the coastline and eucalypt woodlands in the middle. The rocky shores are great for fishing. Further south along the eastern coast is Foochow Beach, where there are two shipwrecks, and in the southern end of the beach is Patriarch Inlet. 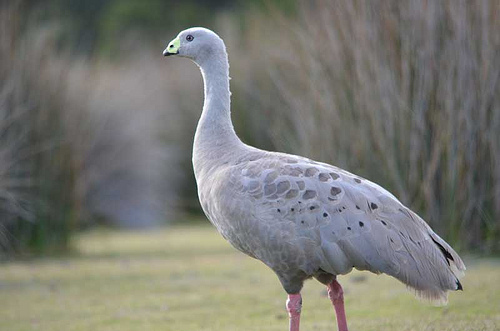 Off the shore is a muttonbird reserve on Babel Island, and further south is Sellars Lagoon. South of Sellars Lagoon is the beautiful Cameron Inlet, and a few more lagoons. Inland is the Lackrana Wildlife Sanctuary and south is the Pot Boil Point Wildlife Sanctuary. In the southern end of the island is Lady Barron – the second biggest town on the island, with shops and eateries, and a few places to stay, such as Silas Beach, Bucks at Lady Barron, Lady Barron Holiday House and Yaringa Cottages. In the south-western corner of the island is the island’s most famous and most spectacular place to visit – Strzelecki National Park. 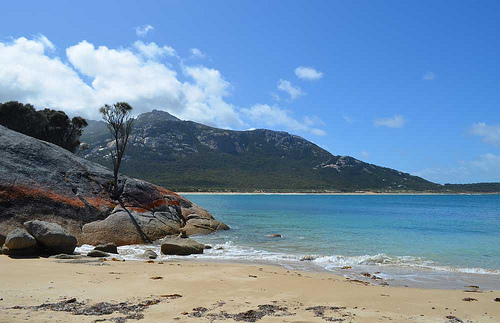 There is some great scenery there, some rugged Devonian granite rocks, camping grounds, and both short and long bushwalks, including the one to the 756m Strzelecki Peak – the highest point on the island. There are also some Aboriginal middens and plenty of wildlife like common wombats, Tasmanian pademelons and Bennetts wallabies. South of the Flinders Island are Cape Barren Island and Clarke Island. There is a small settlement on the Cape Barren Island, but the rest of both islands is wild. 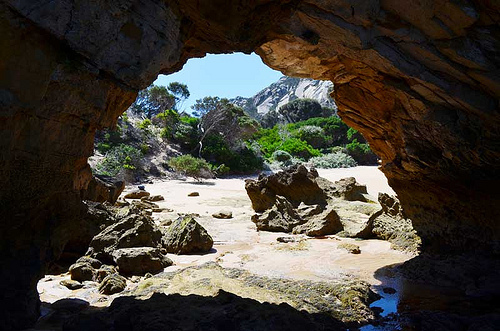 There are many small islands around Flinders, Cape Barren and Clarke islands, many of which are muttonbird reserves. There are also a few shipwrecks around the islands, but not nearly as many as around King Island. Here's one of Flinders Island maps where I have tagged the places that I mentioned on this web page. You can click on the tags to see what places they are, and double-click anywhere on the map to zoom it in and see the places closer. Drag the map to move around, and if you want to see the satellite image with Google Earth, click on "Sat" in the top right hand corner. 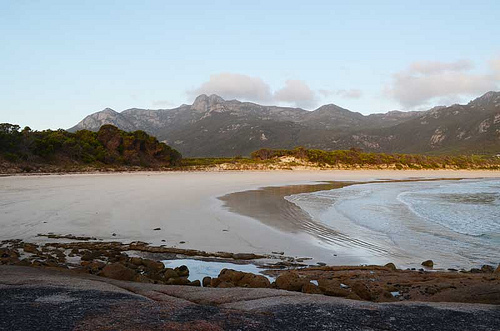 Been to Flinders Island or Live There? 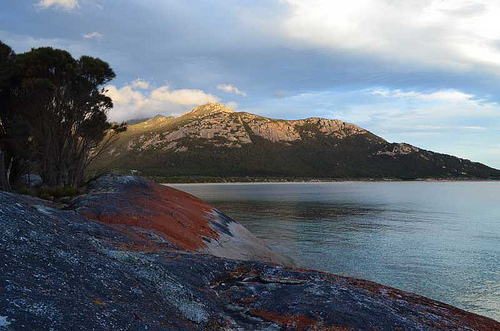 Have you been to Flinders Island or do you live there? We all love to read about other readers' stories!